Roland TD-17 Sound from TD-50, 300 sound, users sample etc.New VH10, New Kick, New snare. 3 different models of the TD17, 1400 1800 and 2400 Australian dollar. KL KV (all mesh and 12" snare) and the final with a high hat pedal as well. Sounds very customizable, and based on the TD50 sound module, imports wav, transients, etc additional VH10 hihat, KD10 kick, new 12" snare and new shell kick. If you are logged in you will also see a picture. BTW, your link doesn't go anywhere. Roland announces new The new TD-17 series combines flagship-level sound with newly developed pads. The playing experience is very close to playing an acoustic kit, accurately mirroring the physical movement, stick coordination, and hand/foot control that every drummer needs. It’s a perfect digital drum kit for serious skill building at home too, thanks to its authentic playability, onboard coach function, Bluetooth connectivity and more. delete see my main post edited. Would it have killed them to ditch the cable snake and have separate ins for each pad? I'd pay a little premium for that functionality. the samples sounded of high quality. But didn't seem to have many velocities. Sounded like a popcorn machine to me on the metal kits. still its gonna sell like bonkers. Sound came from TD-50 and refurbish sound from past flagship, it still sound Roland.. yes repeat sound are there, but Roland for the first time, they used sound from flagship to lower level, this should replace td11. I don't think this is the first time. The TD-12 had the same sound set as the then flagship TD-20. Also (not exactly a flagship) the TD-8 sound set was used on the lesser TD-6. And people always say that the TD25 module is a light version of the TD30 as it also has TD30 sounds in it and some of its functionality. To me it seems like roland is constantly rolling out old tech and somehow spinning it as new. Reps doing demos dont always know what they are talking about. But Micheal know what he is talking about, he test and talk directly to Roland engineers, he tested 1 years in advance td-50 in his show no one knew it, and reports how it behave, digital ride\digital snare with dense lights vs capacitive live, and if still all reliable with traveling and show after show etc. He reports from people demand to them. The same sound are from td-50\old flagship tweaked anyway, cymbal are the same, sound still synthetic overall thin sound from Roland palette. I think you are missing my point. Im not saying he doenst know the td17 and cant play. He is very good at what he does and he knows how to use the modules it would seem. Im just saying as good as he is, no one is beyond making a mistake. And Roland actually has a history have taking the current flagship and putting its technology in a lower cost drum set. I think this is the best attempt and it hits the lowest price bracket but the TD25 was based on the the TD30. And at that time the TD 30 was top dog. I think you are missing my point. Im not saying he doesnt know the td17 and cant play. He is very good at what he does and he knows how to use the modules it would seem. Im just saying as good as he is, no one is beyond making a mistake. 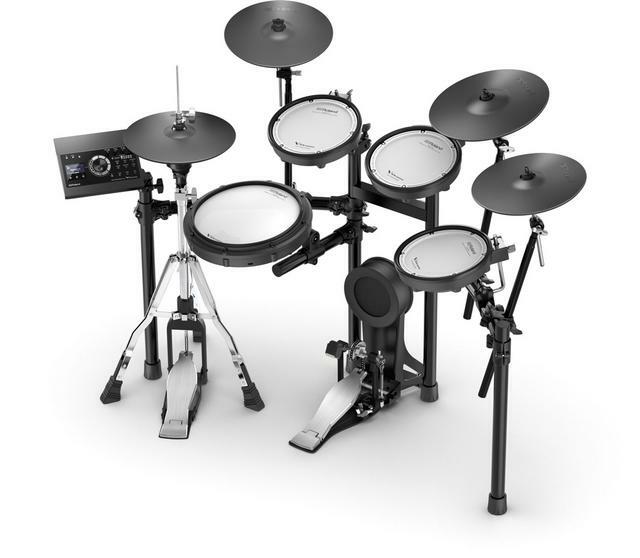 And Roland actually has a history have taking the current flagship and putting its technology in a lower cost drum set. I think this is the best attempt and it hits the lowest price bracket but the TD25 was based on the the TD30. And at that time the TD 30 was top dog. yes im sorry you are correct. I have no idea why it quoted the wrong post. Apologies. No worries I've also made similar errors and tend to preview my responses before posting. I tried today td-17, and still sound machine gunning, with synthetic same as video. I guess Roland, the sound are not really their main priority. to me it sounds like a decent sound but no depth. Its like the toms and snare play the same sound no matter what velocity you hit the drum. Its like the same exact sound just louder or softer. it's because they use like under 4 layers, and they use DSP to manipulate the sound real time, instead of round robin and things like this, so the overall result, not natural sound, lack of richness, clarity on the overall kits. which would explain rolands ability to get super fast triggering and no load times. They are barely pushing any actual information. Lets see them apply their technology to something like the strike. I bet that latency number jumps few notches. The latency things is PR, real latency behind acoustic drum is about 5ms, their latency is 3ms on td-30\td-50\td11\15\17 more faster machine gun in headphone, it is impossible to see any difference for human been, most vst are running 7ms to 10 ms with module that you saw on youtube. Yamaha dtx 502 latency is 12ms, go try it in a store, and you will barely see any difference switching to td-30 at 3ms.. They said on Roland event, the reason they never let imports one sound sample in the time of td-11\15 because latency would increase, yes only one shots sample, it took td-50\td-17 to imports sample, at 3ms.